A woman with two wombs has given birth to three children in what is believed to the first case of its kind, a hospital official said Friday. Hannah Kersey, 23, gave birth to three girls in September, said Richard Dottle, a spokesman for Southmead Hospital in Bristol where the triplets were born. The children spent nine weeks in the hospital but the reason was not disclosed. The girls — two identical twins delivered from one womb and a third, fraternal twin — were born seven weeks early by Caesarean, the British Broadcasting Corp. reported. Kersey and her partner Mick Faulkner said they were "over the moon" at how healthy and happy the girls were. "They are three lovely and incredible children, all with very different personalities," the BBC quoted Kersey as saying. "There haven't been any similar accounts where three healthy babies are born of two wombs," said Yakoub Khalaf, a consulting gynecologist at Guy's and St. Thomas's Hospital. He said that multiple pregnancies tended to be risky, and that delivering triplets under such abnormal circumstances was even riskier. Khalaf said that simultaneous pregnancies in two separate wombs are rare, but not unheard of. He has identified just 70 such cases in the past 50 years. The delivery of triplets from two wombs has never been recorded, he said. 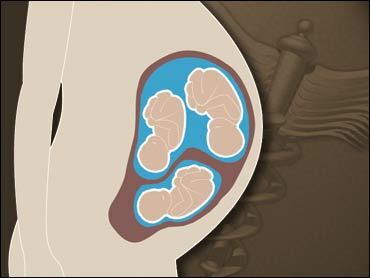 Separate wombs, sometimes known as a uterus didelphys, are uncommon, although not rare. About one woman in 1,000 has them, according to Khalaf. The condition would have occurred before Kersey was born when the two sides of her womb failed to merge completely. Because of that, the separate wombs tend to have a considerably smaller volume and their contractions are weaker, said Michael Heard, a consulting gynecologist at the Royal Hampshire County Hospital in Winchester. Pregnancies are possible, although they tend to result in premature births more than half the time. Heard said that in the case of a Caesarean two operations would have to be performed. "This lady was extremely lucky," said Khalaf. Kersey was not immediately available for comment on Friday but the Southwest News Agency based in Filton, England, said it had bought the rights to her story. It would not disclose the amount.